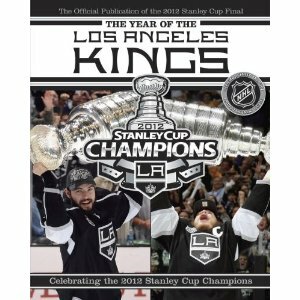 The Year of the Los Angeles Kings: Celebrating the 2012 Stanley Cup Champions , is the only officially endorsed and licensed Championship book by the NHL and is the must-have Stanley Cup collectible for all fans of the game! The Los Angeles Kings won their team's first Stanley Cup after a dominant postseason run that saw them go 16-4 while setting a record for Playoff wins on the road. They started the season as unlikely contenders, built a strong team over the season, and then battled their way through the two-month marathon that is the Stanley Cup Playoffs. In the end, the Kings' roster not only looked like a Cup champion, but played like one. Led by American-born captain Dustin Brown, the Kings dominated the postseason. Drew Doughty and Anze Kopitar, complemented by newly acquired forwards Mike Richards and Jeff Carter, formed the core of a team that faced the best in the League, and won. But the emergence of Conn Smythe winner Jonathan Quick was the true key to the Los Angeles victory.